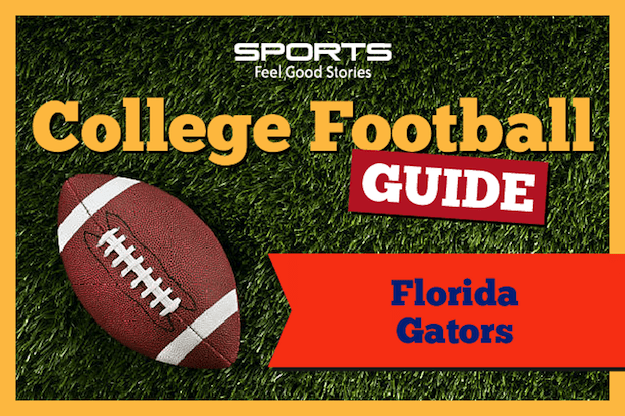 Our Florida Gators Football Fan Guide provides all the needed information to get up to speed on the team this season. The University of Florida is one of the signature programs of what’s largely known as the toughest college football conference, the SEC. The Gators play at Ben Hill Griffin Stadium, affectionately known as “The Swamp,” and have won the SEC eight times. During the 111 seasons of Gator football, Florida has won three national championships. They’ve had three players win the Heisman trophy and 50 first-round NFL draft picks. Over their long and illustrious history, the Gators have had some notable names pass through their program, including Steve Spurrier, Urban Meyer, Emmitt Smith and Tim Tebow. The Gator Chomp This is one of the most recognizable jesters in all of college sports. The Gator Chomp was recognized by collegemagazine.com as one of the top-10 college football traditions in 2011. The Chomp will usually make an appearance when the marching band plays the theme from “Jaws” prior to kickoff and after big plays during the game. This pregame cheer has been a fixture of games at Ben Hill Griffin Stadium since that fateful day, and it continues despite Edmondson’s “retirement” in 2008. This rivalry between the two oldest public universities in the state has been going since 1958. Also known as the “Sunshine Showdown,” Florida dominated the matchup until Bobby Bowden took over at FSU in 1976. From 1990 to 2000, each meeting featured the schools being ranked in the AP top 10, and in six of those seasons the winner would go on to play for the national title. Florida leads the all-time series 34-26-2, but FSU has won the last five matchups. This rivalry is one of the oldest in college football, having started in 1915. Also known as “The World’s Largest Outdoor Cocktail Party,” this game has been played almost exclusively in Jacksonville, FL, since 1933. In 95 total meetings, Georgia leads the all-time series 50-43-2. There have been dramatic upsets throughout the rivalry, and the winner has typically gone on to play in the SEC championship game. This rivalry pits two of the founding members of the SEC conference. The series has been on-going since the schools have been part of the same conference since 1910, and they played their first football game in 1916. Thanks to the irregular conference scheduling, the schools have met only 47 times, with Florida leading the overall series 27-20. Although Tennessee dominated the rivalry in the early years, Florida won 11 matchups in a row from 2005 to 2015. Will Mullen resuscitate the Gators’ offense? It’s been ten years since Dan Mullen was in charge of the offense in Gainesville, and there hasn’t been an effective quarterback piloting the Gators since Tim Tebow left in 2009. Mullen will have his work cut out for him in an effort to erase the memory of last year’s 4-7 campaign, but the last time he was around, the Gators won two national titles. Can the run game help the Florida quarterback? No matter who takes over as the signal caller for the Gators, there’s a good chance they’ll have a solid running game to lean on. Junior running back Jordan Scarlett has a chance to break the 1,000-yard barrier. Junior Lamical Perine is also a starting-caliber back. Sophomore Adarius Lemons has big-play potential. Is this a bounce back year for the defense? By the end of the 2017 season, the Gators’ defense was in disarray and teams were running up the score late in the season. That said, there are quality pieces that can help reestablish Florida’s defense in the nation’s top-15 once again. The Gators have solid defense ends to employ in their new 3-4 scheme, and cornerbacks Marco Wilson and CJ Henderson could be the best duo in the SEC. Being one of the storied programs in arguably the most competitive conference in college football, the Gators have had a number of memorable names pass through the school. Over the years, nearly 300 former Gators have played in the NFL. The “Head Ball Coach” as he came to be known defines two stretches of Gator football. The first, he was a Heisman trophy winning quarterback. Then as one of the most successful head coaches in college football. Spurrier’s “fun ‘n’ gun” spread offense defined an era in college football and led to six SEC championships and one national title. He’s the winningest coach in Florida history and is one of four members to be inducted into the College Football Hall of Fame as both a player and coach. Perhaps better known for his time in the NFL with the Dallas Cowboys, Emmitt Smith was a dominant force at the college level while at Florida. The NFL’s all-time leading rusher spent three years at Florida and left with a number of school and conference records. He was SEC Player of the Year and a unanimous first-team All-American in 1989. He was part of the original induction class of the school’s Ring of Honor and is a member of both the College Football and the Pro Football Halls of Fame. A dominant defensive end at Florida in the late 60s, Youngblood went on to a Hall of Fame career at the NFL level. Youngblood’s pass rushing abilities changed games while he was at Florida, and he was voted as the No. 5 Gator of all-time by The Gainesville Sun in 2006. He was also part of the initial group of inductees for the program’s Ring of Honor. One of the most polarizing figures in sports in recent decades, Tim Tebow is one of the most decorated players in the history of college football. Tebow helped Urban Meyer’s Gator football teams to a pair of SEC championships and two BCS National Titles as well. Tebow won the Heisman Trophy in 2007, then was SEC Player of the Year in 2008 and 2009. By the end of his time at Florida, Tebow held a number of school, conference and NCAA records. There’s no doubt he’ll be part of the College Football Hall of Fame and the school’s Ring of Honor in the near future. Dan Mullen enters his first year as head coach of the Florida Gators football program after nine years as head coach at Mississippi State. Mullen is an offensive mind. He spent much of his career prior to being a head coach as a quarterbacks’ coach. He spent three seasons (2005-2008) as the Offensive Coordinator and Quarterbacks Coach at Florida under Urban Meyer. In 2014, he was SEC Coach of the Year while at Mississippi State. You’re on Florida Gators Football Fan Guide.